ProSmoke E-cigarettes have been around since 2009 and are one of the most popular brands in the U.S. They are the only e-cigarette brand to be fully certified with American Green Business Bureau, making them a certain environmentally friendly choice. Additionally, they are heavily involved in helping the smoking community in finding a healthy freedom from tobacco as well as regularly donating to various cancer research charities. Green and helping the community is their motto. 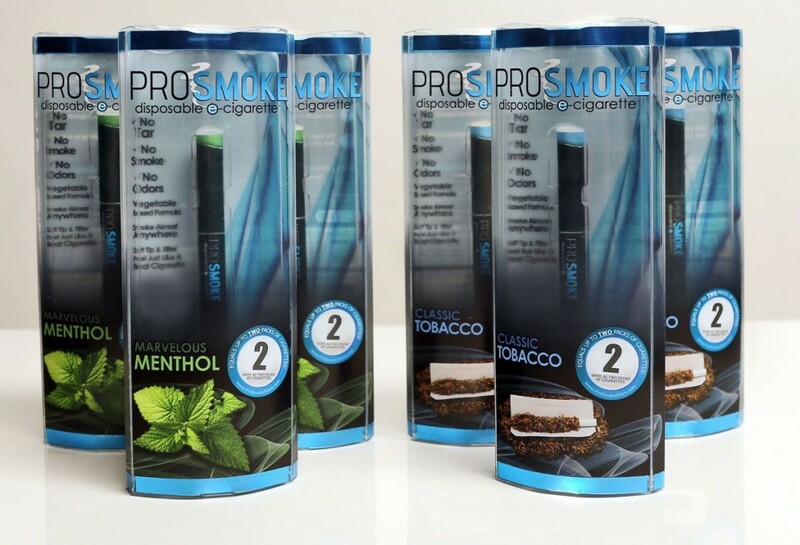 ProSmoke offers advanced electronic cigarettes with solid technology and performance, and they tried to bring as much of that into their ProSmoke disposable e-cig. Conscious that a bad experience can turn a smoker first time trying vaping to go straight back to cigarettes, they pride in offering a quality disposable e-cigarette, so what is the verdict? First, let’s look at the design. They are a single piece unit, as opposed to their 3-piece, with the same signature ProSmoke soft tip and filter designed for comfort and realistic cigarette feel. The vapor amount was impressive. It definitely produces lots of vapor and the throat hit is similar to the ProSmoke Rechargeable electronic cigarettes. The flavor was representative of what you get with ProSmoke cartridges and the e-liquid is mostly composed of Vegetable Glycerin, giving it a slightly sweeter taste. ProSmoke disposables are rated to last for the equivalent of 2 packs of tobacco cigarettes, we can agree that they last the 400 puffs for even a heavy vaper. Some may say it slightly less than 2 full packs but not much, while light vaping crowds find them to be longer lasting than most. The ProSmoke Disposable electronic cigarettes are offered in black with a blue LED tip light comes in a package that screams quality. You can purchase a single ProSmoke disposable for $9.99 or you can purchase a 4 pack for $35.99 – making it $9.00 per disposable. This is part of the more expensive disposables but at least they do last for the rated 400+ puffs and would be equivalent to two packs of cigarettes. Anyone looking to really have the best electronic cigarette experience and save considerable amounts of money by switching to e-cigs, should really consider ProSmoke rechargeable models instead. But for those looking to try out ProSmoke, give someone a present, or have the convenience of a disposable once and a while, ProSmoke Disposables make a fine choice. Unfortunately, just like most disposables, major brands could not viably offer all the flavors and nicotime volume options they have in disposable format. The cost of production and holding stock would be too high, therefore, we are stuck with the two most popular flavors, being ProSmoke Classic Tobacco, and Magnificent Menthol. However, what we find to be the least accommodating, is that ProSmoke disposables are only offered in 1.8% nicotine volume, making them either too strong or too light for many, the perfect strength is what it’s all about. Check out our full review, to learn more about ProSmoke Electronic Cigarettes and their product line.